What is the use of Facebook Chatbot? A Facebook bot is an extension to your Facebook Page’s messenger functionality. Each Facebook bot has to be linked with an existing Facebook Page. It gives an impression that your customer support staff is chatting with your visitor through your Facebook page. Although your chatbot talks to your user initially they can always shift to normal chatting mode when they are not comfortable with chatting to a chatbot through our features, which you will learn going forward. Time Saver Chatbots are faster than human, the one thing that matters the most for your Facebook page is your response time. How long it takes you to response to user's query matters. 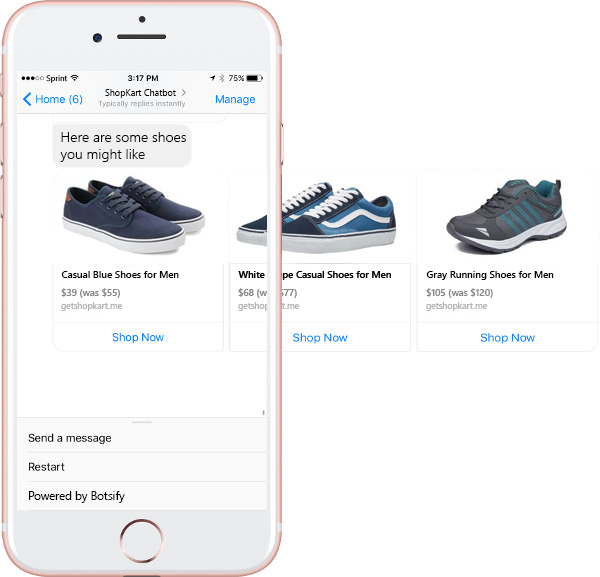 Engage your User until Call to Action Chatbots shrink your conversion funnel and enables your users to achieve their goal quickly in a few steps. New experience and brand imageChatbots are human friendly and maintains the brand image of your product. Human to human conversation might bring chances of mistakes but chatbots can give the exact answers without any fail. Chatbots are easily searchable in the Facebook's bots directory which increases the exposure of your business. Here is how a typical chatbot looks like.